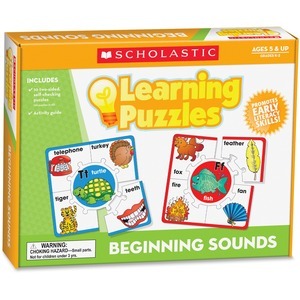 Beginning sounds puzzle teaches and reinforces beginning letter sounds. Unique die-cuts on each puzzle make self-correction a snap. Plastic-coated puzzles are durable and easy for small hands to manipulate. Activity guide allows you to create a more comprehensive experience. Game is designed for children in kindergarten through second-grade.